It can definitely be argued that Wilson Yip has lost his way since his late 90s stint of splendid dramatic efforts (with a hint of quirkiness) such as Juliet In Love and Bullets Over Summer. His invitation to mainstream filmmaking has proven to be a bumpy ride (Skyline Cruisers) and surprisingly good considering (2002, Dry Wood Fierce Fire). The reputation Yip had built up however wasn't able to be furthered in those films but he's always shown a desire to dip his feet in most every conceivable genre. A definite bounce back to the good old days of quirkiness took place in the underrated The Mummy, Aged 19 while last year's Leaving Me Loving You fired on all visual cylinders without enough heart sadly. Silliness is an art. When executed, it's just fun for the cast and crew. When executed well, that fun is picked up on by an audience. As is human drama when done well. Those two aspects take turns in Wilson Yip's first period piece and both are minor triumphs. Despite big sets and fine production design, ultimately what Yip wants to do is have fun initially but before that, he gives action director Ma Yuk Sing the stage. The Tsui Hark produced Era Of Vampires showed that Hong Kong filmmakers could still churn out exciting new wave action although they forget to make a thoroughly compelling film there. Ma's work on The White Dragon leans heavily towards wires, climbing on walls Crouching Tiger Hidden Dragon style, doubling, quick-edits and with Yip adding frames of animated sword cut-flashes to decent effect. Even though bouts are fairly short and not a dominating factor for the film, Ma treats us to some slick Ching Siu-Tung like choreography and that my friends is a rare thing today. Wuxia fans won't be pleased if going into this expecting another Hero or House Of Flying Daggers because after this intro, Wilson Yip goes nuts in the best of ways. Yip sneakily infuses the Ming Dynasty with modern elements, referencing Beverly Hills 90210, McDonald's and he either will completely have sold you or turned you off by the time the concert sequence hits. Cecilia Cheung's Black Phoenix not only has a spinning wheel with her different instruments, she also finishes off the set in true rock n' roll style! I.e. destruction! No, this doesn't fit and things get even more ridiculous when Phoenix first acquires her powers (in a moment reminiscent of a scene in Bio-Zombie). Skill is required to get viewers on board with this content but on the other hand, international audiences is not the target. Hong Kong viewers have been subjected to this for years, of varying quality, but for the clown show to work well, directors need to bring a focus and dedication to each set mood. Yip does and it's been a while since he's had this much fun. We're delighted alongside with him. Then something happens that is so much true for his best work (Bullets Over Summer & Juliet In Love). Confining two characters in one setting, letting their differences play out and the subsequent unlikely bonding, be it romantic or out of respect. Yip's script, co-written by Lo Yiu Fai, clearly isn't intended to echo multi-layered complexity as the development and growing bond between Chicken and Phoenix can be smelled a mile away. The key skill that Yip brings however for this section to gel is a genuine sincerity and humanity. The White Dragon therefore becomes an affecting, familiar journey that allows Yip to concentrate fully on acting as he doesn't cut back and forth between the silliness that doesn't matter. We've had our fun, now it's time to care instead. The isolated setting allows for the martial arts world to matter in the very smallest degree thankfully and space is instead devoted to obviously silly tantrums such as Chicken's childish enchantment with the flute. In a risky twist, Yip's touch turns a scene like this into a heartfelt and joyous character moment for Chicken Feather instead! Even breaking into actual comedy, especially a sequence where Ng is playing with the free gift he got from McD, requires the utmost dedication to the director/actor relationship for it to sell emotionally in the long run. 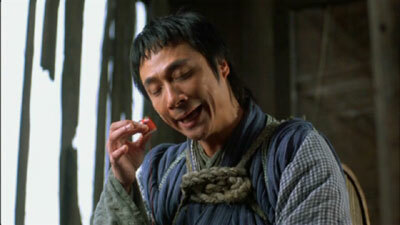 I'll say it again, the best works of Yip's have been with Francis Ng. Ng is excellent and brings a suitable low-key and well mannered aura to Chicken. It's also a rather touching portrayal of abandonment as he tells us of his tormented past and he subsequently discovers the joys of life that the jiang hu never seemed to offer. He strikes up splendid chemistry with Cecilia Cheung who is game for the chosen moods for the film and comfortably handles drama by now. A subtlety is on display that caters well to both actors as their bond continues to grow and be prepared to be affected by their honest and sincere dedication here. It's only towards the final reel that Wilson seems a bit too stuck in the misery of the tale and when bringing in a larger group of characters for the final showdown, we're reminded of the fact that The White Dragon celebrates its triumphs when being smaller in scale instead. Nevertheless, I do regard this as Wilson Yip's finest commercial venture. A silly, touching and heartfelt period piece with an admirable dedication to actually make each mood work. Not churn out a cheap release just for the heck of adding onto filmographies. Universe's 1.78:1 anamorphic presentation has a few nicks and scars while blacks are very good. The soft look of the transfer drags it down slightly however. The Cantonese Dolby Digital 5.1 track mainly uses the front stage for some pleasing effects and for music. Dialogue is also crystal clear. Cantonese DTS 5.1 and Mandarin Dolby Digital 5.1 tracks are also included. The English subtitles are a bit on the large side and more often than not substitutes the name Chicken Feather for just C.F. Other than that, only a few spelling errors turn up and the translation is easy to follow. Traditional and simplified Chinese subtitles are also included. Main extra feature is the 19 minute making of that only comes with imbedded Chinese subtitles. Most every cast member is interviewed, many movie clips are featured but the behind the scenes footage is quite amusing. Star's Files only contains filmographies for Francis Ng and Cecilia Cheung. The 12-page Photo Gallery is actually marked as making of on the right side of the main menu. 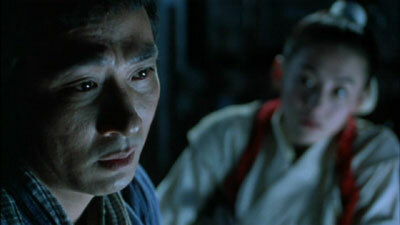 Trailers for The White Dragon, Leave Me Alone and The Attractive One finishes the slim package.